Every two seconds, someone in the United States needs blood. In fact, more than 5 million Americans receive blood transfusions each year, according to the American Red Cross. Depending on the amount and age of the stored blood used, there is evidence that transfusion can lead to complications including infection, organ failure and death. New research from Wake Forest and the University of Pittsburgh School of Medicine found that these complications are likely due to red blood cell breakdown during storage, implying that transfused blood may need to be stored in a different way. This week in the early online version of Circulation, the team reports the latest findings from its ongoing exploration of the interaction between red blood cell breakdown products and nitric oxide (NO), revealing new biological mechanisms that can reduce blood flow and possibly damage vital tissues after administration of blood that has been stored for longer periods of time. 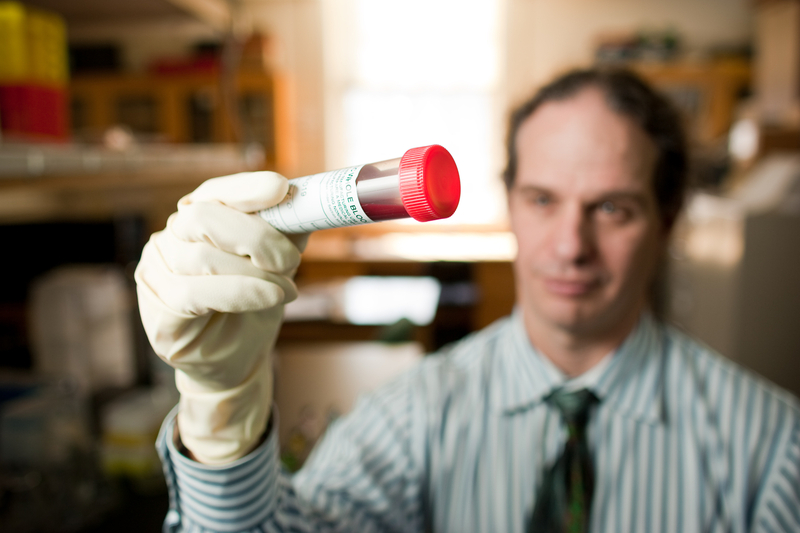 In recent years, doctors have noted that transfusion of either many units of blood or of blood stored a long time may be associated with a greater frequency of complications, such as increased infection risk, kidney, lung or multi-organ failure and death, particularly among medically vulnerable patients, explained senior investigator Mark T. Gladwin, M.D., chief, Division of Pulmonary, Allergy and Critical Care Medicine, Pitt School of Medicine, and director of Pitt’s Vascular Medicine Institute. Gladwin worked on the study with senior author Daniel B. Kim–Shapiro, Ph.D., professor of physics and director of the Translational Science Center at Wake Forest. The scavenging of NO causes blood vessel constriction that can prevent tissues and organs from getting adequate oxygen and activate the platelets and the coagulation system, as well as cause inflammation, the researchers said. From their experiments, they found that human blood stored under standard conditions accumulated “free” hemoglobin that was no longer contained in a cell and microparticles of damaged cells. Those breakdown products reacted with NO about 1,000 times more quickly than did intact red blood cells. Also, transfusion of even very low concentrations of hemoglobin caused blood vessel constriction and hypertension in a rat model. “Avoiding the storage lesion, as it is referred to in our field, could require a new approach to how donor blood is stored prior to transfusion,” Kim-Shapiro said. Other research projects are underway to find approaches to correct the problem and to assess the safety of blood for transfusion that has been stored for longer than 14 days. Currently, federal guidelines allow transfusion of blood that has been stored for up to 42 days. The team includes lead authors Chenell Donadee, M.D., Nicholas J.H. Raat, Ph.D., Albert B. Donnenberg, Ph.D., and Darrel Triulzi, M.D., all of Pitt; and Chen Liu, Hannah Reynolds, and Ivan Azarov, Ph.D., all of Wake Forest. The study was funded by the National Institutes of Health, the Institute for Transfusion Medicine, and the Hemophilia Center of Western Pennsylvania.